8pm Thursday night. Trying to get the kids to bed. Sian suddenly reminds me. "Mum, you have to make us homemade maracas for the morning" AARRGGHHH! Not just maracas but decorated maracas if you don't mind! The next day the girls went into school on the bus with their ribbons flowing from the garish yellow maracas and I promised to come into see the concert at lunch time assembly. Luckily I rang and checked the time as it wasn't until 2.15pm. I would have had a long wait if I went in at midday! The concert was great. The kids sang their hearts out and there was a blur of colourful maracas shaking left, right and center! 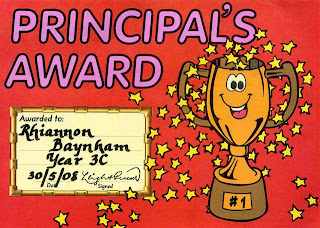 Another big bonus to having gone in to watch this concert was the surprise of seeing Rhiannon being presented with a Principals Award at the same assembly. You can see more about that in the blog below. The Principal of St Josephs gave out two Principals Awards today at the school assembly. One of them was given to Rhiannon !!! She was called up onto the stage and shook hands with Mr Peacock before being given her award. He read out to the school the reason she was chosen for it. "Rhiannon is a friendly and happy class member who is always kind and thoughtful to others. Rhiannon has a positive approach to all aspects of school life and always gives of her best. One of my friends Claire emigrated from Zimbabwe to Australia a few months ahead of us. Claire sent me on an email from her friend saying that a loaf of bread had cost her $190 000 000 yesterday. The prices change on a daily basis and they are lucky sometimes to be able to afford the basics that we take for granted in our kitchens. 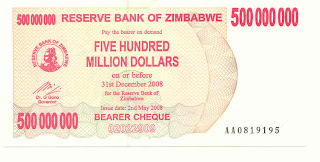 Here is a Five hundred MILLION dollar note that was issued by the Reserve bank of Zimbabwe this month and will only be honoured until the end of this year. 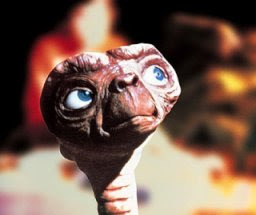 We've all seen E.T. The cute bald alien from the movie. Any hopes of auctioning off this rare and exciting UFO memorobilia faded fast as it it turned soggy from the milk and ended up in Sians mouth! Every Thursday Rhiannon has her "Class Presentation"
This means that the night before she has to prepare something to talk to her class mates about. Sometimes it is a book review, sometimes a "Positive School Issue" and sometimes she gets to be the presenter. This week was her turn to be presenter. She was to welcome the class, give them a rundown on the date and the days weather and then introduce the other kids who were doing their book reviews etc. There is a bit of competition to see who makes the most effort preparing for their presentation and the best kid each day gets the highly prized "DOUBLE TICK" Rhiannon made her mind up last night that this week it would be her. We made a map of Australia with the days weather forecast in symbols as we have done many times before. It wasn't enough for Rhiannon. She decided to rifle through my wardrobe to find something interesting to wear over her uniform. She found my Irish rugby top, a green plastic hat and an Irish flag tea-towel. With a glint in her eye she came up with a plan. Back we went down to the computer and made an Irish map with the Irish weather on it. She decided to confuse her teacher by dressing up in green and announcing the Irish weather forecast before finally doing the normal and expected Australian one. She practised and practised at the breakfast table until she knew the weather in Dublin, Wexford, Cork, Kerry, Longford and Belfast by heart. What really tickled her was that each of these places had the same predicted weather... Rain! Yes! She had got the prized "DOUBLE TICK" !!!! Gareth is enjoying going to Rugby, he gets to play with his friends. Byron is enjoying going to Rugby, he gets to watch his boy run around a muddy field with an egg shaped ball. Sian is enjoying going to Rugby, she gets to spend time with her Dad. Rhiannon and I enjoy them going to Rugby because we get to sit down in a quiet house and do "girl" stuff! It's been a busy few weeks with Gareth playing rugby every Saturday morning and attending his rugby training every Tuesday evening. I think I enjoy it more than he does to be honest, my little lad playing rugger, that's my boy! Anyway, it generally means that the whole family is leaving the house by 8am to go and watch the little terrier play. I'm not sure if he's totally committed to playing yet; he does seem to have fun running around the pitch with his mates, but being only 5 he frequently loses concentration and spins around "doing helicopters Dad" while the game carries on around him. Sian also loves rugby training although her age group now plays full contact rugby, and I'm not too keen on her getting her teeth knocked out, so she trains with the younger ones. During match time as we all cheer Gareth on, I can't help shouting "Gareth! Get stuck in there" or "Gareth! Watch the bloody ball" every so often, but I should really just keep quiet and applaud at the end when the game is over. Just last weekend I decided to congratulate a rather old and gnarly referee on a good game. As soon as he discovered I was Welsh it was handshakes all round, and a "follow me, I've got something to show you". Anyhow, after proudly showing me a 1992 Ebbw Vale rugby shirt that he carries around in his bag (not sure why! ), he was absolutely convinced that I'd love to play rugby with the "golden oldies". From what I can gather these are hardened, seasoned pros that have never stopped playing. "You'll fit right in" says the delighted referee at his newly found recruit. "It will be great" says Gina thinking of all the new people I'd get to meet. "Go for it" says Mr Newton with a twinkle in his eye. On reflection, I may give this opportunity a miss. After all, Mrs B banned me from contact sports years ago after several shoulder dislocations. She even banned me from my favourite game of badminton for the same reason (it was a hell of a good backhand smash, although it was a shame my shoulder hit the net). So, banned from contact sports and badminton. But rugby is okay apparently ! When I mentioned to the ref that I had dislocating shoulders he quipped "that's okay, if you are carrying any injuries you wear red shorts so you get tagged instead of being fully tackled". So, in the heat of the moment, as 'arry the 'orrible is charging for me, he's going to notice my red shorts and slow down and tag me? Or does instinct take over and he just chews my head off instead....? I'm not convinced. I'd better improve my medical insurance cover fast. Joe and Rhonda came to see us last weekend. It had been Joe's Birthday during the week so we decided to have a little party for him. We blew up balloons and went to town making lots of food we thought he would like. We started with Irish brown bread and salmon. Not as good as Mum makes it in Dublin but I can always blame the Australian flour can't I! Cian didnt seem to mind and tucked right in! Then we made some cookies and a trifle with lots of custard and raspberries finished off with a load of cream and sprinkles. When Joe text to say he was running an hour late getting to us I decided I had time to try a new cake from an Australian recipe book Jane gave me. It was for a Dark Chocolate mud cake with Chilli Cherries! Yum! The recipe said to add some Bourbon to the cake or substitute with a favourite whiskey. Out came the bottle of good old Irish Jameson and a healthy amount went in the saucepan with the melting dark chocolate. We used chillies from our chilli tree in the garden and the chilli fumes coming out of the saucepan were killing us! The end result was a rich chocoholics dream with a spicy sting in the tail! Happy Birthday Joe, We hope you didn't need to put the toilet paper in the fridge the next day!!! The kids school has a Mothers Day Mass each year. This is a chance for Mums and Grandmothers to come along and join the kids in school for a tear jerking mass and morning tea. In our family because we have emigrated we don't have the pleasure and fun of having Granny from Dublin or Nanny from Wales with us at special events like this. Anne plays a special "surrogate Granny" role in the lives of our kids and makes a real effort to come to things like this for them. It was really nice to have Anne join us this year. Granny in Dublin and Nanny in Wales, we missed you a lot at this Mass and were thinking of you. You are very special to us even though you are far away. Why, oh why can't Mothers Day be a monthly affair?! What a good day. The kids were so excited going to bed last night. Plastic bags rustled from behind their bedroom doors and cards were hidden in wardrobes. I was given strict instructions to stay in bed and not to go down and make the morning cup of tea. There were crashes and bangs from the kitchen as Byron made a lovely breakfast despite help from the three kids! They all piled into the bedroom where I had to pretend to be sleeping and then woke to find a tray with croissants and a lovely cup of tea in front of me. The kids had bought me gifts from the Mothers Day stall in school. They go in with $5 each and get to choose anything from the large selection of gifts. I had helped at the stall this year and knew all the different things that were available so I was very excited to see what they had chosen for me. Sian chose beautiful bowls with soap, fancy face cloth and mini shampoos and conditioners. Rhiannon got me a pack of scrapbooking papers and Gareth got me soap in a tin. The girls had chosen what they thought I would most like for myself. Gareth however loves soap and it didn't take him long to unwrap the one he gave me and disappear into the bathroom where he spent the next half hour singing away and making bubbles to his hearts content! The rest of the day passed at a slow and relaxed pace. We decided to plant my Lemon and Lime trees in the garden as they have been in pots for the last two years waiting for us to choose where to plant them. Then we decided to plant the bottlebrush trees that we had been given by the mayor for our Citizenship. The kids jumped in the spa while Byron and myself sat back with a cup of tea and admired the changes in the garden. We went out for coffee and cake in Toronto in the afternoon and then came home and vegged some more. The kids are in bed now and I still have 2 more hours until Mothers Day ends for this year. I might just be able to get another cup of tea out of Byron if I hurry up and publish this! When Gareths friends Tommy and Darcy wanted to start training with the Macquarie roos Under 6 team we were pleasantly surprised when he said he wanted to go too. It was an exciting 15minutes to each side and all the kids played their hearts out. They all were surprisingly coordinated and seemed very clued in to how the game worked. They passed the ball well, did line-outs and scrums and scored 7 tries! Gareth was focused in the first half and raced after anyone with the ball and the few times he got his hands on it he ran like the wind. He scored a try which had Mr B in seventh heaven. By the second half they were running a bit slower and were slightly less focused. A passing helicopter had a few of the boys mesmerised for a minute or two while the game carried on around them! It was a great day and Gareth cant wait till training again next week. 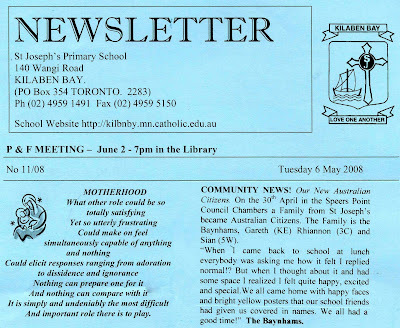 The Principal of St Josephs asked Sian about what it felt like to become Australian Citizens and when we got this weeks newsletter we saw that he had put it in! If the text is too small to read just click on the picture and it will enlarge. Camera repair trip: Crimewatch style. My camera has been playing up for the last few weeks. Almost every time I turn it on it says "change the batteries" despite having new batteries or freshly charged ones. Off we went this weekend to the camera shop in Newcastle where we bought the camera to get their opinion on it. The staff were very helpful and spent quite a while helping to check the camera over while Sian , Rhiannon and Gareth hung around the counters looking at all the cameras behind glass doors. Suddenly our three kids turned super detective and started yelling that a man had just left the shop with two pairs of binoculars stuffed in his pockets. They had watched him fiddle with a lock on a glass cabinet and got anxious when he put the things in his pockets but still thought he might be going to the sales staff to ask how much they were (?) but as he walked out the door they knew he was stealing them so they ran over to tell the staff. There was no way of catching him as he had jumped on a bike and was gone before the staff could get to the street. The girls gave really good descriptions of the mans height and build, his clothing (down to the logo on his work top and hat) and the colour and style of bike. The staff were very grateful and took our details in case they need to follow it up. They gave the kids handfuls of freebies, pen holders, magnets and mini torches as a thank you for being such good Super Sleuths. It was an adventurous shopping trip and we think we may have fixed the problem with the camera too! It was time to go get a strong coffee! It's that time of year again. Sports Carnival. The day that should be all about the fun of taking part and having a day away from the confines of school. The reality for me is usually about running around like a headless chicken trying to find Sian and Rhiannon in a sea of 350 kids all dressed in identical uniforms and school hats. This year I was running around after 3 kids as Gar is now in St Josephs too. It seemed like as soon as I found one kid and ran over to cheer them on I would get word that another of the kids was about to run a race and that I needed to sprint across the field in the other direction. Enough moaning, it was a good day. The sun shone and the kids were happy. I had stopped off at the supermarket on the way and was carrying around fruit, water and sweets with me. I didn't choose my environmentally friendly bag very well. All day I was seen clutching my bright red LiquorLand bag to me as I dashed about. There were plenty of jokes about the contents! I made a BIG mistake of opening a bag of jellybeans and giving a small handful to Gar and a few of his friends. There are 50 kids in the Kindy year and very soon they had all got wind that "Gareth's Mum" had a big bag of beans that she was sharing out...! I wont be doing that again next year! Unfortunately the camera batteries died a few minutes after turning on the camera (A regular occurrence recently despite charging them the night before) I only managed to get photos of Gareth and his friend Tommy doing the sack race. They both thought it was so much fun. They bounced their little hearts out. As for the rest of the day, you will have to close your eyes and imagine it. I hate being without my camera. I will be straight off to the camera repair shop this weekend! At last we have a new family kitchen table! We have been using an outdoor table set for the last two and a half years while we waited for the new house to be built and then for the money to be saved up. We have looked in numerous shops and eventually bought the very first table we saw over a year ago. It arrived today and an hour later two friends, Monica and Maree were sitting at it having coffee and hot chocolate. The chairs must have been comfortable because 3 hours later we were still sitting there chatting!